Yesterday I attend SDL’s DITAFest. While it’s a vendor-driven show, there were several valuable presentations and information to help get clearer about designing content. And we do need to start looking at the possibilities on tap. Beyond deeper instructional design (tapping into both emotion and effective instruction, not the folk tales we tell about what good design is), we need to start looking at content models and content architecture. Let me put this a bit in context. 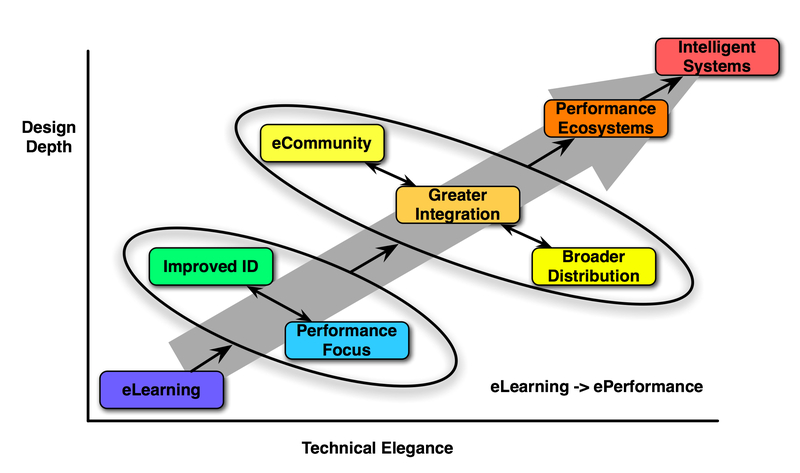 When I talk about the Performance Ecosystem, I’m talking about a number of things: improved instructional design, performance support, social learning and mobile. But the “greater integration” step is one that both yields immediate benefits, and sets the stage for some future opportunities. Here we’re talking investing in the underlying infrastructure to leverage the possibilities of analytics, semantics and more, and content architecture is a part of that. So DITA is Darwin Information Typing Architecture, and what it is about is structuring content a bit. It’s an XML-based approach developed at IBM that lets you not only separate out content from how it’s expressed, but lets you add some semantics on top of it. This has been mostly used for material like product descriptions, such as technical writers produce, but it can be used for white papers, marketing communications, and any other information. Like eLearning. However, the elearning use is still idiosyncratic; one of the top DITA strategy consultants told me that the Learning and Training committee’s contribution has not yet been sufficient. The important point, however, is that articulating content has real benefits. A panel of implementers mentioned reducing tool costs, reduced redundancy savings, and decreasing time to create and maintain information. There were also strategic benefits in breaking down silos and finding common ground with other groups in the organization. The opportunity to wrap quality standards around the content adds another opportunity for benefits. Server storage was another benefit. As learning groups start taking responsibility for performance support and other areas, these opportunities will be important. And, the initial investment to start focusing on content more technically is a step along the path to start moving from web 2.0 to web 3.0; custom content generation for the learner or performer. A further step is context-sensitive customization. This is really only possible in a scalable way if you get your arms around paying tighter attention to defining content: tagging, mapping, and more. It may seem scary, but the first steps aren’t that difficult, and it’s an investment in efficiencies initially, and into a whole new realm of capability going forward. It may not be for you tomorrow, but you have to have it on your radar. Building on yesterday’s post, in another way of thinking about it, I’ve been trying to tap into several layers down. Like the caveat on an attempt at mind-mapping the performance ecosystem, this only begins to scratch the surface as each of these elements unpacks further, but it’s an attempt. The plan you take (your sequence of prioritized goals), the metrics you use, and your schedule, will be individual. However, the other elements will share some characteristics. Your governance plan should include a schedule of when the group meets, what policies guide the role of governance, what metrics the governance group uses to look at the performance of the group implementing the plan (ie how the executors of the strategy are doing, not how the strategy is doing), and what partners are included. 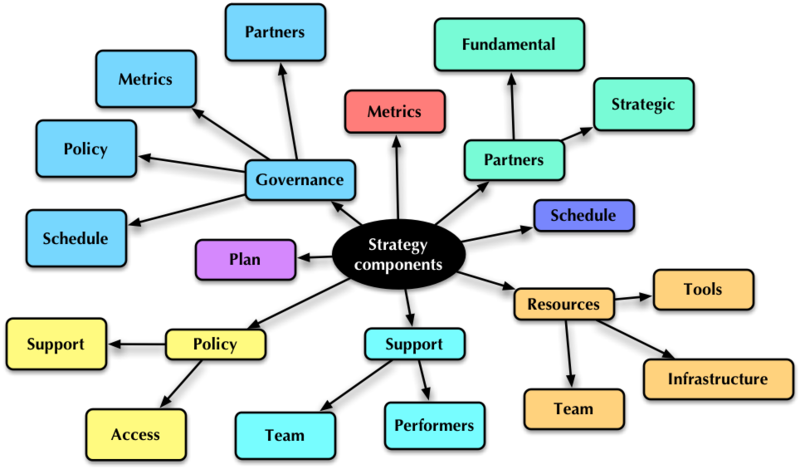 The strategy will need partners including fundamental ones providing necessary components (e.g. the IT group), and members who may have political reasons to be included such as power, budget, or related interests. The resources needed will include the people, the tools, and any infrastructure elements to be counted upon. Support capability will include supporting the team with any questions they might need answer, and also the folks for whom the strategy is for. And there will need to be policies around what responsibility there will be for support, access to resources, and other issues that will guide how the strategy is put in place, accounting for issues like security and risk. I’m sure I’m forgetting something, so what am I missing? 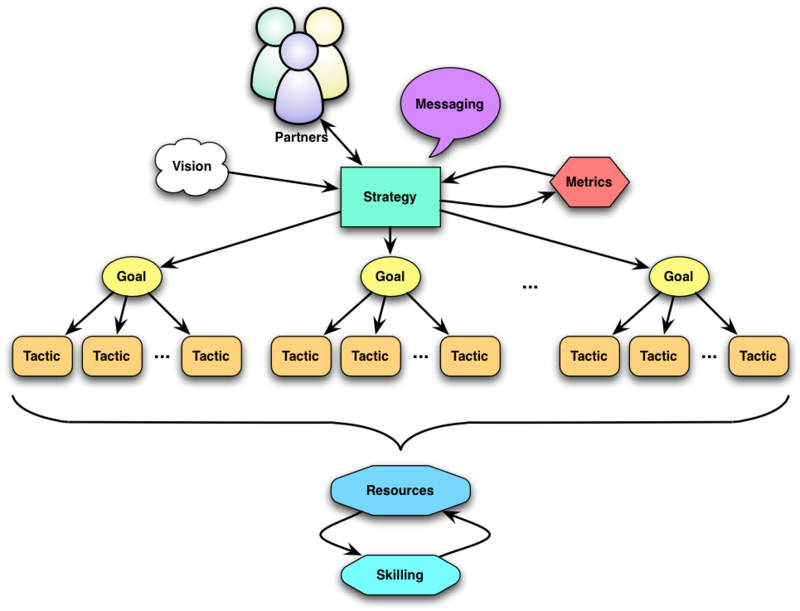 I’ve been involved in a lot of strategic thinking lately, both for clients and workshops (e.g. my mobile strategy workshop at DevLearn next week), and so it’s forced me to reflect on what strategy is. I’ve previously talked about the technology components of an elearning strategy, and how they tie together, but I need to take another cut at it. Naturally, I’ve been diagramming as my way to get my mind around strategy as a set of conceptual components that are necessary to identify and get right, regardless of domain. A strategy has to start with a vision of what you’re trying to achieve. From there, you need to break it down into goals that, together would achieve this outcome. Multiple things go along with this: the tactics that achieve the goals, the metrics that you use to measure your progress and success, the partners you need to work with, the resources you’ll need, the continual development of capability of the resources, and the messaging you’ll use to get others to buy in and assist. It goes further, of course. Stay tuned for tomorrow. This is … a well-presented, concise, and documented presentation of just what is needed to make a working classroom, and how technology helps. The ultimate message, however, is that this book is important, even crucial reading. This is a book that every player with a stake in the game needs to read: teachers, administrators, parents, and politicians. And not to put too delicate a point on it, this is what I think should be our next “man in the moon” project; implementing these ideas comprehensively, as a nation. He’s given us the vision, now it is up to us to execute. I most strongly urge you, if you care about schooling, to read the book, and then promote the message. 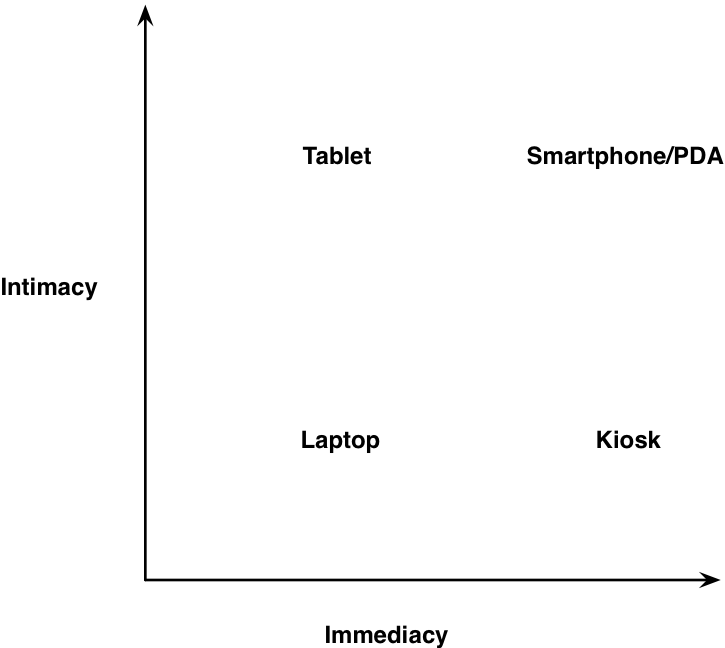 I’ve been wrestling with the difference between the smartphone (or PDA, aka the ‘pod’) versus a tablet (aka the ‘pad’), and it occurred to me that one way to think about it might be to distinguish between ‘intimacy’ and ‘immediacy’. By immediacy, I’m talking about how you use the devices. 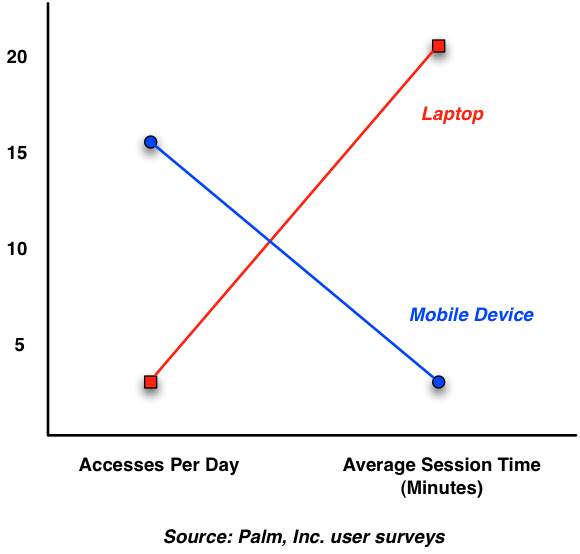 As Palm documented a long time ago, you use laptops only a few times per day, but for long periods of time. Whereas you use mobile devices many times a day for quick access. Tablets are actually more used like laptops in this respect. You don’t tend to whip your tablet out, answer a quick question, and put it away. The size tends to make it awkward to whip in and out, and instead is more amenable to using for a period of time. Of course, smaller tablets may bridge the gap. By intimacy, I mean the relationship to the device. As Judy Brown defines a mobile device, it’s small enough to fit in your pocket, has a battery to last all day, and you really know it. I’m particularly picking up on the latter, and moreover, that you can customize it. David Pogue has opined that it’s not really the smartphone that matters, but rather the ‘app phone’, and I think it’s important that you can optimize the device by loading it with capabilities that accessorize your brain. Though you can add ringtones, and even some apps (via, for instance, Brew), it’s much harder to augment your capabilities without a rich market of differentiated programs. There’s more. For one, the smaller screen means you have the device closer. Laptops are inherently at arms length (or at least forearm’s length), to effectively use a keyboard. The smaller screen of a mobile device invites it closer, as does the small keyboard, using thumbs instead of the whole hand. A touchscreen interface also invites a different relationship. This gives me a framework for distinguishing between the devices. 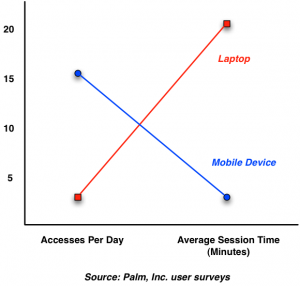 A laptop, even if customized by your applications, isn’t intimate, and by size isn’t used with immediacy. 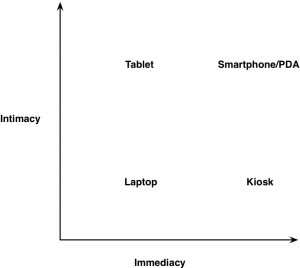 Tablets are intimate, but not immediate. Smartphones are intimate and immediate. Finally, there’s the category of immediate but not intimate. This might be the use of a touchscreen kiosk you find at a public spot or in a museum, or perhaps also using someone else’s device for a quick access. This seems to give me a handle on thinking about the differences between tablets and smartphones & PDAs (I think the iPod touch is a great device, say for kids in schools). Does it work for you? I attended the CLO Symposium with my ITA colleagues Jay Cross and Jane Hart. It was an interesting event, with a theme of “Game-Changing Learning: Development for the New Normal“, held at a classy venue on the beach, and was well-organized. (You can see Jay’s writeup here.) And the keynotes that I saw were in synch: Stephen Covey talked about the need for trust and Jon Katzenbach on how to build culture were both excellent, as was Dan Pontefract’s story on making collaboration intrinsic to Telus. At a lower level, however, the conference felt mired in the past. Jay, Jane, and I ran a unpanel where we took questions from the audience and took turns answering it. Some folks even had trouble with the format, apparently! We got questions about how the role of the learning unit changes, about myths and new tools, and about measurement. Our riff inspired some subsequent inquiries if we could assist. Well, but of course! A lot of the other sessions also seemed to deal with measurement. A special lunch was held specifically around creating a standard set of measurements: effectiveness, efficiency, and business impact. While the latter is business specific, the other two could be handled. Efficiency tends to mean things like amount per hour of training, etc. Effectiveness was less clear, but I’m afraid we’d see pre-post test messages instead of number of people completing the competency test (happy to be wrong). My problem here is that this stuff shouldn’t be a topic in 2011, it should be already well-practiced and in the repertoire. We should be thinking about how to start tracking meaningful activity in social networks, the value of performance support and more, not old stuff about courses. And, how to tie it back to important deltas in organizational performance. As for addressing the social and informal metrics, while I addressed this a bit earlier, let me go a bit further. If you are putting in performance support (e.g. a portal, but *ahem*, well-designed) or social network, you should be asking yourself what it should be achieving. Is it closing more sales? Generating higher revenue per sale? How about less time spent on customer calls? If you put in an HR portal, you should expect less calls to HR. If you put in a social network among sales folks, you might expect a higher percentage of closing. Figure out what change this should affect, and then find a way to measure it. Which should be the indicator that you have a problem in the first case! Which is not to say there weren’t good topics on tap too: leadership development for agility, bridging the gap between IT and the learning unit, informal learning, etc. But when other topics are ‘how to talk to executives’, in- or out-sourcing talent, and on-demand training, it’s clear we’re not where we can, and should, be. “The future is already here, it’s just not very evenly distributed”, as William Gibson has said, but I guess my concern is with some of what is considered game-changing in an era where the new normal is continual innovation and perpetual beta. Things are moving too fast not to already have mastered the basics of measurement, and be thinking about adapting. The ability to talk ‘business’ should be a pre-requisite for the job, and the strategic issues need to be culture and collaboration. We’re getting there, but then patience has never been one of my strong suits ;). My first job out of college was designing and programming educational computer games. I had to do the TRS-80 Model I before I got to work on an Apple ][, but I finally bought a ][e, and sold it to my company shortly thereafter as I headed off to graduate school. 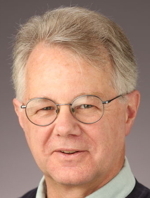 I was a grad student in an HCI lab (with Donald Norman, who went on to become an Apple Fellow), and so I was very aware of the Macintosh (I’d coveted a Lisa before that), and bought a Mac II to write my PhD thesis on. Since then I’ve only used Macs as my main machine (tho’ there has been the odd PC around the house). And that’s quite a few; in my office right now is an iMac DV, a Powerbook Wallstreet and also a G4, as well as an old and a new MacBook Pro, iPhone, and an iPad. And let’s not dismiss the software. Despite some quirks, the OS has a solid foundation, and the interface experience on top of it is pretty good. I learned HyperCard (even though I’d moved on from programming), love Keynote, think Pages is *almost* there (the outlining is not quite yet industrial strength), etc. So you can imagine it was with some unexpected sadness that I learned about the passing of Steve Jobs. Enough has been said about the fact that it wasn’t just the surface design, but his insistence on a comprehensive user experience. It has also already been covered that it was much more than that, it was the insight into the market, e.g. not just the iPod, but iTunes. Not just the iPhone, but the whole reengineering of the relationship between hardware provider and telcos. Industry-changing stuff, and absolutely true. But I want to talk about one other thing that has somewhat passed under the radar. How many of you would have liked to work for Apple? You didn’t hear much about it, like you might with Google, but it seemed like a pretty cool place to hang out. And there are two aspects to this. One is that you didn’t hear much. In the notoriously gossipy Silicon Valley, Apple was remarkably resistant to leaks. I think this is reflective of the other component. While you can install some pretty rigorous constraints, I think you do better if you instill some loyalty. And I think that while Jobs was at times dictatorial, as has come out, I think he did it through selling a vision inside the company as well as outside. It has been said that the best form of government is a benevolent dictatorship (the only problem is ensuring the benevolent part), and I think Steve Jobs made a company doing things worth getting behind, and I suspect that it was pretty easy to go along with some of the constraints because you knew why they were there. But it has to also be a place where you can make mistakes, as Steve made them himself, starting with the Apple ///. I think that Apple has wanted the best, but rewarded folks for being that, too. This is all inference, as I never worked there, and haven’t discussed it with the few people I’ve known who worked there. But some pretty fabulous stuff has come from there, and it can’t all be one person. So I just wanted to acknowledge that he not only built products, and a company, but a culture that allowed the company to succeed, wildly. I’m somewhat skeptical of the ability to use a university model to develop executives who can perpetuate the Apple success, but the fact that they’re trying is worthy of consideration. I think they can continue to succeed, but I hope that they have some other approaches too. And, that, to me, is a lesson to take away from this. Steve Jobs was inspiring, but he recognized it was more than just luck, it was a habit of mind that can be developed. Not only do you have to pursue your dream, but there are skills and habits of mind that go along with it. And if you recognize that, identify those skills, model them, develop them, and reward them, you can build a successful company. The initial Learning 3.0 conference (well-done, Phillip, Julie, & Leah) was held in conjunction with The Motivation Show, a large conference (dwarfing our little group) and Expo on incentive and recognition programs. And it’s thought-provoking. First, you have to know that while I understand sales commissions and rewards, because they *work*, I don’t like them. It seems to me to be rewarding a behavior of convincing people to buy things they might not otherwise do. And, yes, I know that there’s a move to solution selling (through one of my partners I’ve done a fair bit of work on sales), but still, solution selling hasn’t always worked (partly because it often isn’t implemented well: e.g. the incentives are still aligned with product selling). So you can imagine my reaction as I walked the motivation expo hall on the last day. Aisle after aisle of vacation destinations, gourmet foods, luxury items, and more. It would’ve been a great shopping experience if you were well-heeled and this wasn’t focused on corporate buyers. And I became curious. We’d heard that there are incentives for many things: health, safety, and more. I’d heard of rewarding innovation. I wondered if, as I cynically believed, this was largely for sales rewards instead of those other things. And while I couldn’t get the answer as clearly as I wanted, it wasn’t as bad as I’d thought. What I found was that sales was something less than a quarter, consumer promotions roughly a quarter, business gifts roughly another quarter, and employee recognition rounded out the last quarter. So, 70-75% or so was on the transaction side and the rest was for employees. Moreover, talking to one of the recogntion system vendors, it became clear that this trend was new; that sales *had dominated, but they were moving to recognizing that this could apply more broadly (tho one of the venue folks noted that the show had shrunk from years before). And I think it makes sense. Look, there are product and service designers working to come out with new and better products that better serve the market, and increase sales. And, as one of the attendees I shared lunch with noted, if the learning group offers improved sales training and product training, and it creates a delta in sales, why don’t they get a share? Now, this whole incentive ‘motivation’ thing is “gamification”. They’re creating simple reward things that increase behaviors, but they’re extrinsic, not intrinsic (cf the distinction between gamification and what I call engagification). And, as Dan Pink’s “Drive” says (as did the keynote by the former CEO of Texas RoadHouse), intrinsic awards work better. I think I’ll stand by my belief that sales incentives can end up creating a situation where people are rewarded for getting people to do things that they’re not inclined to do. And while some may argue that it is in the best interest (e.g. getting people to be safe, or exercise, or eat better, which I’d argue folks largely would like to do), in general I reckon most folks wouldn’t like to buy things that they might not otherwise purchase. And for those who think I’m being too harsh on sales, let me ask what they think would happen if those incentives went away and sales folks were on salary only. Would you have happier consumers? Look, I’m still happy to do the best I can to make sales training and product skills the best it can be (and I’ll suggest that the design principles I espouse will do that as well as it can be done), because it is largely independent of the rewards structure. I just want that, as a society, we might want to look at the tradeoffs. When teachers impact society in more important ways (granted, in my opinion), I think we might want to be looking at increasing their performance more than sales folks. Reckon? 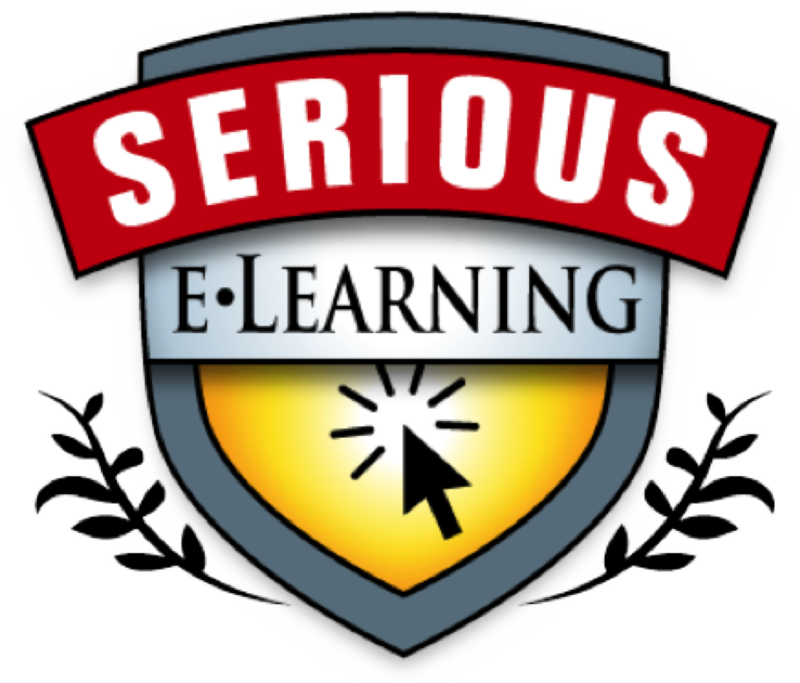 The wise Ellen Wagner has a neat post about what should be the ‘ten commandments’ of online learning. I agree with them, and recommend them to you. I have thought about it in a slightly different, but similar frame. What I mean by a killer learning experience is one that is engaging and effective, ie all the principles of Engaging Learning. It’s a pedagogy that’s challenging, meaningful, relevant, tightly coupled, and more. It’s also social, having you learn with others, not just on your own. Developing the person means not only developing their knowledge of the topic, their degree, but also their success factors. That includes things like helping them develop a portfolio of work, developing skills in working with others, communicating, etc. In essence, layered on top of the domain knowledge are 21st century skills, which are likely to be the only lasting value you can provide learners (c.f. Father Guido Sarducci’s 5 Minute University). And finally, it’s about not just providing the content and having the learner sink or swim, but instead actively looking at the learner’s performance, finding ways to scaffold the learning and being attentive to signals of potential trouble. It’s data-driven adaptivity to the individual learner, coupled optimally with human intervention. And competency-based, so the learner has clear indications of what they need to do. We can do this, on a cost-effective basis, and I reckon it’s going to be the only sustainable differentiator to be a successful provider. The only question then becomes: who’s going to bring it all together? The market is waiting.